I can't quite remember what triggered my undying love for the Tudor period, but when I think back on it, I believe it started when I was about 15 - at the same time the movie "The Other Boleyn Girl" came out in theaters. Although I had heard of Anne Boleyn and King Henry VIII before, I knew very little about their time period, but I remember walking away from that movie completely in love (and in tears). It was around then that I started picking up Tudor-era novels - starting with Philippa Gregory's, of course. (Thank you, Philippa!) As soon as I finished her Tudor series, I moved onto other well-known historical fiction novelists, such as Jean Plaidy, Kate Emerson, Diane Haeger, and Robin Maxwell...and the love grew! Soon, I was learning so much about the people and events through these novels, that I moved onto nonfiction - the potentially boring and difficult-to-read stuff - and my interest only grew more! I would like to thank Alison Weir and Elizabeth Norton for providing me with such great details and facts about the Tudors, and I think it would be impossible to grow bored while reading their books. However, books and movies could only last so long, and once I was finished with them I found myself still thirsting for more. So, I did what any self-proclaiming history nerd would do - I started spending my free time researching the Tudors. Every chance I got, I would sit down at the computer and google a name - then read virtually everything I could find until I felt I had a good grasp on the person, place, or event. Pretty soon, it became something I could talk about all the time (to anyone who would listen), and my friends and family would sometimes humor me with questions and discussions about the Tudors. This love for the Tudor Dynasty has only grown more and more for the past 5 (or so) years, and I don't see it ending any time soon! In fact, I've begun entertaining the idea of pursuing a career involving history - maybe as a professor, author, or historian. The possibilities are endless when you love this stuff as much as I do! I took that first step in July of 2011when I thought I might like to manage a blog...and that blog became a website! I'm having a fantastic time with it. In July 2015 I graduated from Mansfield College, University of Oxford, with a Master of Studies in Modern British and European History. My dissertation research focused on the posthumous reputations of the last Plantagenet kings (Edward IV and Richard III) and popular opinions about them in the following Tudor period. 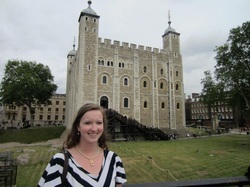 It was amazing to live and work in a place that has so much Tudor history, and I did plenty of touring around historical sites for my blog. I hope to make many trips back to England to visit in the future, although I am now back home in the Washington, D.C. area! Most of my work on The Tudor Enthusiast is now based around book reviews of related books (both fiction and non-fiction, and anything within the late medieval-Elizabethan eras). I'm always happy to hear from authors and publishers about reading and reviewing books for them. It has become my favorite thing about being a Tudor blogger! Thank you so much (again) for checking out my website and blog! I truly hope you're enjoying it.